What if you could challenge your third graders to design a swing set that’s safe but still lots of fun? With this volume in the STEM Road Map Curriculum Series, you can! 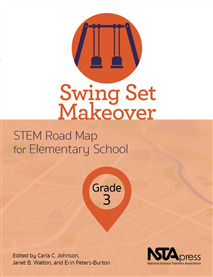 Swing Set Makeover outlines a journey that will steer your students toward authentic problem solving while grounding them in integrated STEM disciplines. As are the other volumes in the series, this book is designed to meet the growing need to infuse real-world learning into K–12 classrooms. •	Compare swing set designs for both safety and fun factors. •	Recognize gravity and friction as forces; evaluate the forces that affect both children’s bodies and swing sets on the playground; and spot ways these forces play into design challenges. •	Use the engineering design process to create alternative shapes and designs for a swing set. •	Collect data using mathematical tools and record data with line plots and bar graphs. •	Build models of their proposed designs and write blogs to summarize the improvements that maximize playground fun while minimizing risks.